One thing we’re always doing on Pets in Omaha is encouraging adoption and advocacy for shelters and rescue groups. Stories like the one below are awful, but perfect in helping us promote our mission. Adopting an animal saves a life. Shelters will add that it “saves another life- the dog that takes your adopted animal’s place.” Also, your generosity towards shelter and rescue operations provides humane organizations with the means necessary to continue carrying out their work. If you can, donate to your favorite shelter or rescue so it knows you’re behind it in saving animals like the one below. The Animal Rescue League (ARL), a Des Moines animal shelter, is caring for an emaciated dog that was locked inside a pet carrier and thrown into a dumpster. 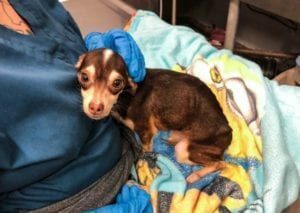 Oscar was given food and water to consume when he was ready; after a very short period, the KWWL article said, Oscar gained a full pound (he was only four pounds upon his rescue) and continues to improve. We can’t control what people do to animals like Oscar. The situation he was put in is terrible. What we can do is advocate for the shelters and rescues that save animals like him AND we can encourage everyone to adopt when looking for a new companion animal. If you’re able to do either, we thank you. It’s with your support that ARL and others can continue to save lives like Oscar’s. Click here to donate to ARL or find its website here. Currently (Nov. 12, 2018) donations are being matched, so your money gets doubled as you generously give to Oscar and others.